February 5, 2017, 9:22 PM · Sirena Huang was named the first-prize winner in the first-ever Elmar Oliveira International Violin Competition, following the Finals and Saturday and Sunday at Lynn University in Boca Raton, Fl. First Prize ($30,000): Sirena Huang, 22 of the U.S.
Second Prize ($15,000): Alina Ming Kobialka, 19 of the U.S.
Huang made her solo debut with the National Taiwan Symphony Orchestra at age nine and has since has been featured as a soloist with more than 40 orchestras, including the New York Philharmonic, Shanghai Symphony Orchestra, Singapore Symphony Orchestra, Cleveland Orchestra, Baltimore Symphony Orchestra, Staatskapelle Weimar in Germany, and Russian Symphony Orchestra. 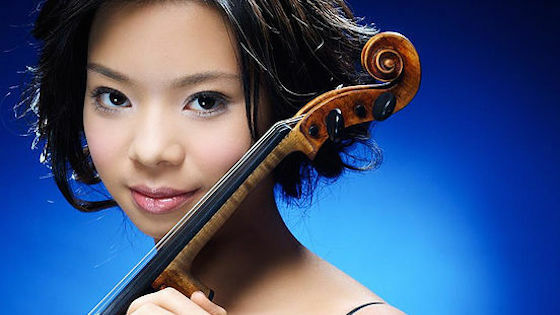 A veteran of the competition circuit, Huang won Third Prize at the 2016 Shanghai Isaac Stern International Violin Competition; Third Prize at the 2015 Singapore International Violin Competition; the Hannloser Prize for Violin at the 2013 Verbier Music Festival; and First Prize and the Audience Award at the 2011 Cooper International Competition. In 2009 she won First Prize in the International Tchaikovsky Competition for Young Musicians (not to be confused with the International Tchaikovsky Competition). As First-Prize winner of the Oliveira competition, Huang also will receive a new modern violin, crafted by violin makers Feng Jiang, Jeffrey Phillips, Andrew Ryan and John Young; a silver-mounted bow from Eric Lane; a Musafia Case; a signed copy of The American Violin; and a $250 gift certificate from the International Violin Company. She also will receive public relations and artist management support, and future performances with the following orchestras and festivals: Atlantic Classical Orchestra, Fort Pierce, FL; Bach, Beethoven and Brahms Society, Brookline, MA; Brevard Symphony Orchestra, Melbourne, FL; Music in the Mountains, Durango, CO; and Newport Music Festival, Newport, RI and more. Her teachers have included Linda Fiore, Stephen Clapp and Sylvia Rosenberg. The Oliveira competition began last week with 20 competitors, ages 19-31, from eight countries. Jury members for the Oliveira competition include Daniel Heifetz (Chairman), Andrés Cárdenes, Gudny Gudmundsdottir, Ilya Kaler, Vera Tsu Wei-ling, Alexander Gilman and Charles Castleman. BELOW: First Prize winner Sirena Huang performs the first movements from Mozart Concerto No. 5 and the Tchaikovsky Violin Concerto in the Olivera competition Semi Finals, Part 2. February 6, 2017 at 05:58 AM · I feel uncomfortable with these competitions. At this one in the US, places one to three have gone to US violinists. Yet in Indianapolis all but one of the finalists was from South Korea - and they feature highly elsewhere too. In Russian competitions there are more Russions placing. At the Wieniavski competition, more Polish violinists. I am not doubting any of the violinists but results seem less than evenly distributed. February 6, 2017 at 01:02 PM · What violin did Ms. Huang play in the competition? Is that the violin she's pictured with? February 7, 2017 at 03:09 AM · It actually makes sense that there are more applicants from the home country of a competition, especially an inaugural competition. That being the case, there will be more "cream of the crop"-type applicants from the home country than the less-represented countries, simply because there were more to choose from. As the competition generates more interest, assuming it does, it will likely get higher numbers from other countries as good players recognize it as a legit competition. With this in mind, I think it makes sense that competitions, and particularly "young" ones, tend to have more applicants from the home country that advance. February 7, 2017 at 03:53 PM · At the risk of ruining the party, to me Sirena Huang plays like a really really good student playing a difficult etude really really well. Which is to say she is not yet at the level of today's top soloists. Of course she still has plenty of time and opportunity to mature and I am looking forward to that. Also, I wanted to point out that, to me, it appears as if she is not really comfortable playing the violin. She does not appear free. February 7, 2017 at 04:46 PM · I'm with Jean.